VANCOUVER — Washington State University Vancouver’s Chancellor Mel Netzhammer provided an optimistic outlook for the year ahead during the chancellor’s annual State of the Campus Address Wednesday. Netzhammer began his address by briefly affirming WSU Vancouver’s commitment to DACA students, as well as reflecting on the “weaponization of free speech,” including what he classified as attacks on inclusion and diversity. Netzhammer said he was “impressed, pleased and proud” with how the campus community had responded. Enrollment at WSU Vancouver was the first topic Netzhammer addressed in detail. WSU Vancouver has approximately 250 new students this spring semester, and the unofficial enrollment count was 3,321. Growing enrollment is a goal for WSU Vancouver, Netzhammer said, as increased enrollment allows the university to address its institutional needs. Part of the growth of the campus population, Netzhammer pointed out, was an increase in the veteran population. WSU Vancouver boasts 265 veteran students, which is an 11 percent increase from last year, and the highest number of veteran students on campus ever, Netzhammer said. Students of color comprise 26 percent of the student population, Netzhammer said. Another highlight of enrollment was that through the Running Start program, which allows high school students to earn college credits while in high school, 29 percent of freshmen had enough credits to qualify as a sophomore or junior. For several years, the Washington State University system has been deficit spending. Under the leadership of President Kirk Schulz, Netzhammer said the university has been working to end its deficit and build its reserves. According to Netzhammer, going forward there will be a 2.5 percent system-wide spending reduction. This does not equate to a budget cut, Netzhammer said. Effectively, the spending reduction means that each WSU campus, including WSU Vancouver, is authorized to spend 97.5 percent of its budget, and the remaining 2.5 percent is diverted to the campus reserve fund. “We still are in a good budget scenario at the moment,” Netzhammer said. Last month, Netzhammer said that the state legislature had passed a capital budget. Part of that capital budget plan allowed for new construction on WSU Vancouver’s campus. Netzhammer said that the university is currently in the pre-design phase of constructing a new life sciences building on campus. Netzhammer then discussed WSU Vancouver’s efforts to update its 10-year-old master plan. Part of the master plan includes the construction of a building for Vancouver iTech Preparatory school for Vancouver Public Schools. Currently, iTech is housed in university buildings on campus. The university is also working to add housing as part of its master plan. Currently, the campus is zoned as a university district, and Clark County does not consider housing as an appropriate use. Netzhammer said that updating the school’s master plan is the first step in letting the county see that housing is an appropriate use for the land. There will be several community open houses regarding the master planning process, with the first taking place at WSU Vancouver on Mon., Feb. 5 from 4:30 p.m. to 6:30 p.m.
Netzhammer said that updating the master plan is an ongoing process, and that while the draft final master plan may be completed by June, it will not be until the fall when the master plan is officially approved. 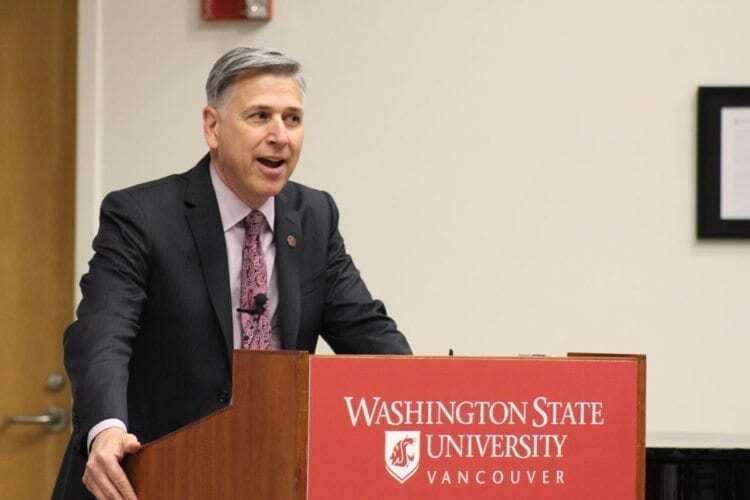 The final part of the State of the Campus Address revolved around WSU Vancouver’s strategic plan, Destination 2021. The plan has been in place for 18 months, Netzhammer said, and is comprised of five goals. The five goals include research, student success, growth, equity and diversity, and community. Research at WSU Vancouver has increased and improved under the strategic plan, Netzhammer said. Publications by faculty have increased, as has the amount of money devoted to research. There has also been an increase in interdisciplinary work on campus, Netzhammer said. Several efforts designed to contribute to student success have been launched. The university has implemented a first-year experience seminar class for freshman, and enrollments in that class have increased. Netzhammer said that the university will continue to monitor the success of students that took the seminar, to see if it contributes to greater retention and graduation rates. Netzhammer said that part of the growth of the student population on campus can be attributed to the addition of several new majors during the first 18 months of the strategic plan. These majors include entrepreneurship, math, integrated strategic communications and a masters in electrical engineering. Additionally, in the fall the university will offer a major in data science. According to Netzhammer, student success and growth are interlinked. Netzhammer highlighted WSU Vancouver’s efforts to pioneer open educational resources, or free textbooks and materials, in the state of Washington. Over the course of the coming year, Netzhammer said that the implementation of more open educational resources will save students over $200,000. To help foster equity and diversity, Netzhammer said that WSU Vancouver hired Obie Ford III as the campus director of equity and diversity last April. A new program of equity and diversity training will also be implemented fully in the fall. Netzhammer said that there has been a marked increase in participation at diversity events on campus. “I’m really excited that we have energy around inclusion on our campus,” Netzhammer said. Going forward, the chancellor said that one of the main objectives for WSU Vancouver is to eliminate the “achievement gap” between students of color and their Caucasian counterparts. Finally, Netzhammer discussed the university’s continued efforts to foster partnerships in the community. WSU Vancouver recently entered into a formal partnership with the Columbia River Economic Development Council to help create and develop relationships with local businesses and organizations. Netzhammer explained that many partnerships were developed at a grassroots level, where individuals with the university took on initiatives and partnerships. Part of fostering community relationships involves cataloguing the various community partnerships currently in place, and so far over 200 partnerships have been identified, Netzhammer said. “For only being 18 months into our strategic plan, we have accomplished a lot,” Netzhammer concluded.